Team Giraffic Shark reviewed this attraction on October 28, 2017. 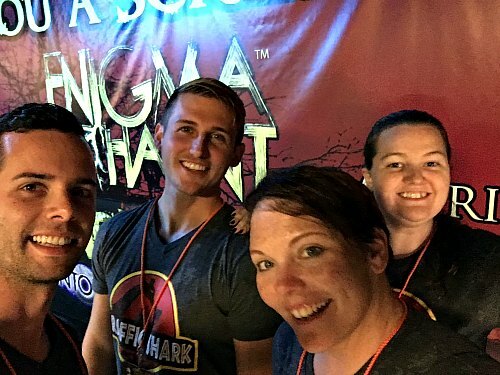 On a rainy night late in October, Team Giraffic Shark visited ENIGMA HAUNT in Boca Raton, FL. Unfortunately, due to the weather, the queue and outdoor entertainment was not operating, but once inside the doors of ENIGMA HAUNT, the team was impressed by the creative layout and scares covering 2 floors of terror. Advertised as three haunted attractions, ENIGMA HAUNT is more along the lines of one single haunt with several different themed segments, rather seamlessly blending into one another, almost indiscernibly. If your autumn takes you to South Florida, check out the scares on the coast at ENIGMA HAUNT in Boca Raton! Two stories of haunts and nearly a 30 minute walkthrough requires a large cast, and ENIGMA HAUNT delivers just that with actors of every sort around each corner. Certain characters require special recognition, including the youngsters in the classroom scene. With great improvisational and interactive dialogue, these children present their teacher who has suffered an unfortunate demise due to their childish playing. These young actors deliver concise and clear dialogue interacting with each Guest. Their parents also act nearby in the attraction, which is smart and a safe decision for haunts with child actors. There were a few locations where scares were not strongly attacked, moving through rooms or sections with little to no scare attempts. In other areas, more effective team scaring could be developed to work off different performers to create a stronger and more dynamic scare. Great performances were also seen by the first character encountered, the nerdy gentleman with the voodoo doll, heavily interacting with Guests prior to their entry into the attraction, as well as the performer spanning the gap between the two floors as Guests move up to the second story. Also, the performer who first attacks Guests when they enter the attraction is strong, aggressive, and a perfect mood setter for the rest of the haunt. Costuming is complete and thorough, creating a large variety of different characters from simple to complex, with varying levels of makeup and mask as well. No characters feel out of place and themes carry through to the character costuming and makeup. Unique and iconic characters are created as well as some recognizable movie characters, though they are well-placed and thought out without random placement. 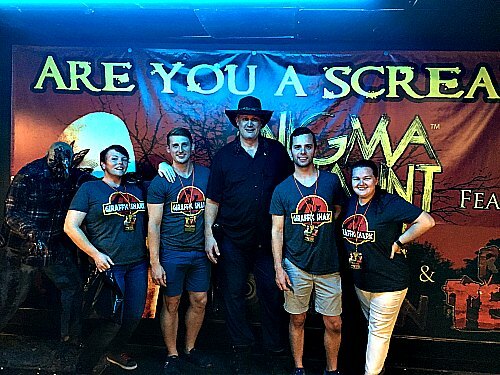 The staff at ENIGMA HAUNT was one of the most gracious, welcoming and friendly teams we have encountered. They were engaging, interested in conversation as well as feedback, and were eager to give local bar and restaurant recommendations for out-of-towners. Even though they were rather occupied with managing adjustments to the operation due to the weather, they were still very Guest focused and making sure everyone was having a great experience. Safety is also top of mind at ENIGMA HAUNT with a safe attraction and walk through. Despite some towels on the ground collecting rain leaks, the path is clear without safety challenges including the stairways during and after the haunt. Unfortunately, we visited ENIGMA HAUNT on a very rainy night, with a tropical storm moving over the coast, forcing outdoor setup and queue entertainment to not be operational. The exterior of the haunt is a simple storefront (the haunt is actually in an old Bally’s gym building) providing little to set the mood prior to entering the haunt. Once entering, however, ENIGMA HAUNT quickly gets things started with a billboard sized photo opportunity as well as other theming, figures, and lighting before entering the haunt itself. On busier nights, there is a queue between two sections of the haunt, which still exists in some darkness, with a projected film loop as well as sounds to keep Guests in the mood of the haunt. ENIGMA HAUNT has a nice mix of traditional effects as well as more advanced special effects, creating a dynamic atmosphere. Well-placed animatronics and other special effects create scares and constant intensity, including one of the most effective laser swamp effect scare scenes we’ve witnessed. Similarly, of special note are the alien puppet scene and the tilted clown room. ENIGMA HAUNT uses some original effects and ideas that are not seen anywhere else to create fun, surprising moments throughout the attraction. Scenes are well detailed and, while scenic elements are sometimes less than high-end professional quality, it is clear that a lot of hard work and time and energy have gone into creating these impressively detailed and effective scenes, covering a wide variety of themes and locations. ENIGMA HAUNT advertises itself as three separate attractions, yet it really is all presented as one long walk through, with three themes. Unfortunately, it is rather difficult to pin point all of the different themes and differences in the haunts, which for a single walk through is almost a bonus as it allows for a more seamless flow. However, to sell the fact that it is three separately themed attractions becomes a little more difficult. 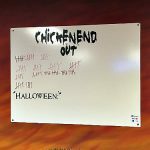 Regardless, the themes that are pulled off explore a vast array of locations including setting, character, sounds, etc., making many different immersive and fun settings from a twisted Christmas scene, to an alien spaceship, to a clown nightmare. ENIGMA HAUNT delivers solid scares overall, utilizing performer-driven scares as well as well-placed special effects startles and scares. 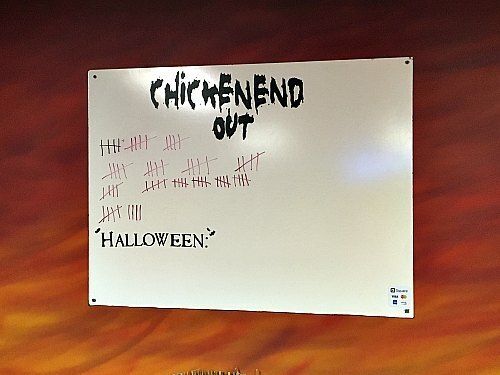 Unfortunately, this is also balanced out by some performers who lacked the motivation to scare and allowed Guests to move through their scenes without much effort to scare. Among the hardest working performers in the attraction were the children, providing creepy stories and dialogue as well as unexpected scares and actions. The attraction still did manage several scares and jumps, so was overall very effective, even though the overall intensity could be carried throughout a bit more to keep it all around the same level. ENIGMA HAUNT boasts a slightly longer than average haunt walkthrough (for what we are considering a single haunt attraction, as there are not separate queues for each) for also a slightly above average price. However, they do a great job at delivering a quality attraction for that price, with action-packed scenes utilizing the space that they have and providing plenty to look at between scares. 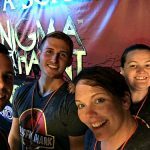 For repeat Guests, the ENIGMA HAUNT team changes a fair portion of the haunt every year to make things different and fun for new as well as repeat Guests. 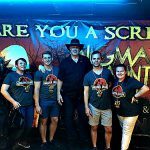 Should your Halloween season bring you to Boca Raton in the future years, check out the great attraction ENIGMA HAUNT and let them scare you and wow you with their great product!